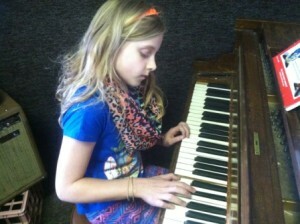 Lessons for Guitar, Piano, Saxophone, and more! Music Maker Studios offers private music lessons for piano, saxophone, guitar, clarinet, flute, trumpet, drums, bass guitar, and voice in all styles of music. Our patient instructors will start you off with simple exercises to get comfortable with your instrument and then get you playing songs as quickly as possible to inspire you to practice whenever you can. If you already know how to play a little bit and you’re looking to develop your skills, we’ll spend the first couple lessons giving you a variety of material to determine what you need to work on, and then develop a program specifically for you. Or, you can play with one of our jazz ensembles if you’re ready to start playing with other musicians. We encourage all of our students to participate in our annual recital in early June once their teacher feels they are ready to perform and the student is comfortable playing in front of others. Participation is not mandatory, but is encouraged. The recital is held at Noble and Greenough in Dedham, and features individual students and ensembles playing many different styles of music. We split the recital into a morning and afternoon performance to allow some flexibility in scheduling for the parents.